It’s a few days late but here’s our round up of 2015. The year got off to snowy start in January fortunately the cold snap didn’t last too long and it was pretty while it lasted. Spring saw the arrival of Poppy our first British Guernsey x Angora goat. 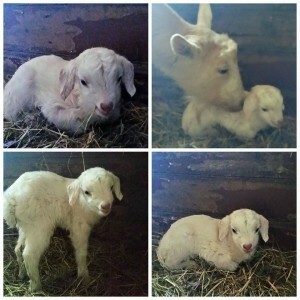 Poppy is the world’s friendliest goat here he is just after being born. The arrival of Poppy meant we could milk his mum Spice and enjoy delicious Guernsey goat milk and a bit of goats cheese. We also had a successful lambing with a lot of twins and even a set of triplets. I continued my exploration of the fibre world in 2015. I’m still spinning and selling our super chunky yarns in the farm shop, together with the fleece from our Jacob sheep and the mohair from the Angora goats. I also started experimenting with natural dyes. 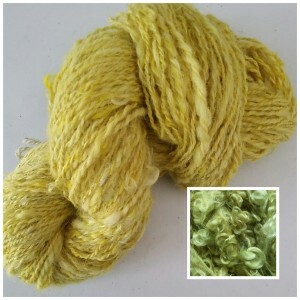 Here’s a picture of some mohair dyed with Weld leaves and a yarn spun from mohair and wool dyed with Weld leaves. As well as growing dye plants I also experimented with using Willow to dye our wool. 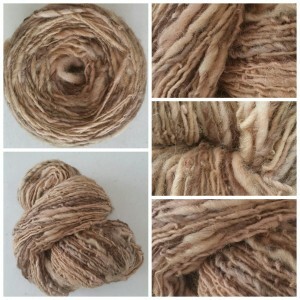 It turned out really well and we now stock Willow dyed fleece in the farm shop. We’ve also started stocking a range of freshly harvested hedgerow dyes (in season) such as nettle, elder, blackberry shoots and apple twigs and leaves. 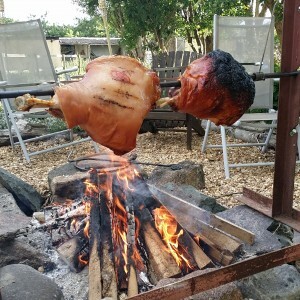 We did a lot of campfire cooking over the Summer and tried out our homemade spit roast. 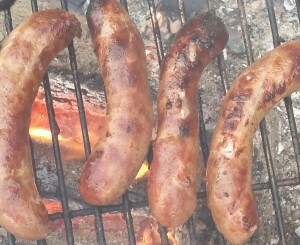 We’ve spent the year working on our sausage recipes and we now have a Classic Pork and a Pork and Apple. Both made at Hooters Hall with our homegrown Gloucestershire Old Spot pork and delicious cooked over a campfire or in a more conventional kitchen. As 2016 starts we’re looking forward to more baby goats (I think both Spice and Amber are pregnant), experimenting with straw bale gardening, more natural and hedgerow dye experiments, growing willow for basketry and trying out some more sausage recipes. The new boys have settled in and get on with the old boys very well. There is such a difference in size / maturity the older boars don’t regard them as a threat at all. There was a lot of sniffing but no fighting or bullying and they all happily shared the same ark which is more than big enough. Here’s a video of them all together. The new pigs are just 8 weeks and it’s interesting to see the difference in size with the others two of whom who are 5 months and two are 6 months. 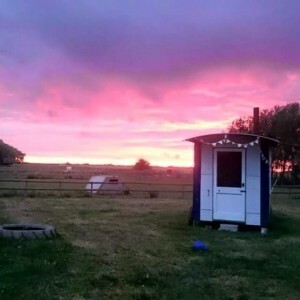 The Hooters Hall pig herd has been resident on the smallholding for about a month now and we’ve also been taking our first steps into farm gate sales over the same time span so I thought it was time for an update. Firstly the pigs. 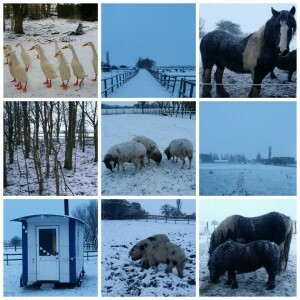 Happily our first 28 days as pig farmers haven’t been a horror film. The boys seem to have settled in very well. They are gradually digging up the paddock but we’ve had no escapes and they learnt very quickly to respect the electric fence. We did have to build a step up to the water trough because they weren’t quite big enough to reach it but they got the hang of this quite quickly. They seem very happy in their plastic ark. it is quite big and can house up to 10 porkers so initially we put some bales of straw in around the walls to make it a bit smaller and cosier. That only lasted 24 hours or so though because the pigs decided to take the bales apart and spread the straw around the ark. The inside of the ark is still quite clean. They don’t use it as a toilet and they haven’t been tracking too much mud inside. So far we’ve just topped up the straw with an extra bale when it got a bit chilly. when topping the straw up we just plonk a bale in the ark and leave it to the pigs to arrange and spread out. We’re feeding them sow rolls as opposed to growers feed because traditional breeds tend to do better, and are less likely to run to fat, on the slightly lower protein content (16% vs 18%) in the sow rolls. At present they are on 3lb per pig / day and from next week they will be on 4lb per pig / day which they will stay on until they go to slaughter. The pig feed comes in 25kg bags so we’re getting through it quite quickly. At the moment we’re picking the feed up ourselves from the local feed store but we might sort out a delivery in the near future. Most books advise to feed your pigs twice a day. We were planning to do this initially but the pigs seemed to go to bed very early in the evening, and didn’t seem keen on getting up for a feed, so we switched to a once daily feed in the morning. We don’t use a trough, instead we spread the feed around the paddock and they feed off the ground. Over the past week, as it’s started getting a bit lighter in the evenings, the pigs have been staying up a bit later so we’re planning on switching to twice daily feeds over the next week. 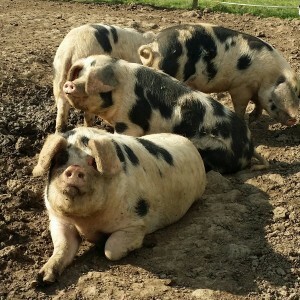 All the pigs are very friendly and like having their backs and foreheads scratched. They are very strong though and if more than one decides to use you as a scratching post it can be difficult to keep your balance. Fortunately we haven’t ended up in the mud yet . As you can see from the video below the paddock grass is gradually being replaced by mud but its not too wet despite some fairly heavy rain. As well as the bought in feed our pigs also get a weekly treat of any eggs that we haven’t sold at the farm gate. Over the past month our farm gate egg sales haven’t exactly made us rich but we seem to have some repeat custom. We seem to sell about a dozen a week although it was a bit slower over Christmas. We put the eggs out on a Saturday, provide egg boxes and an honesty box. We are going to make the sign a bit more noticeable though which will hopefully increase sales. We’ve also put a short explanation about the Cotswold Legbar chickens next to the eggs so customer will know a bit about what they are getting . 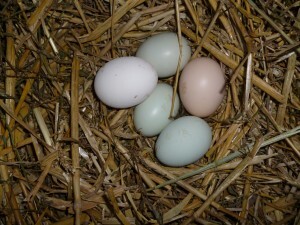 All the chickens are laying now so we have a nice variety of egg colours. Here’s a picture of todays batch.